Gina Guth has combined her love of baking and floral arranging to bring you the bakes and blooms of The Flour Pot. Her baking and DIY classes will allow you to blossom in your culinary and floral design talents. 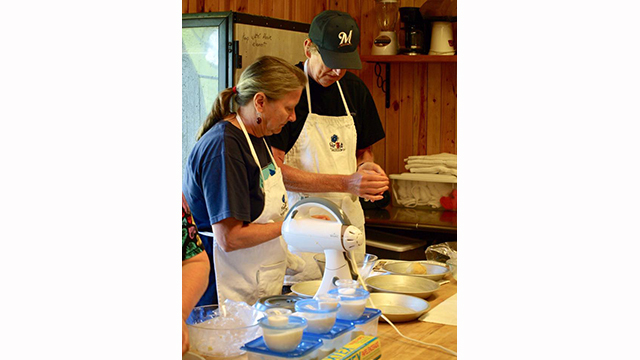 The Flour Pot conducts its baking within a licensed kitchen at the Maplewood Country Cupboard, a store featuring specialty foods and gifts. The location is a short distance from Sturgeon Bay on Hwy. 42. Have some fun learning about a Belgian tradition carried on by generations of Belgian immigrants to America. Each Saturday, May-October during a 2 1/2 hour class, participants learn to make, bake, and take home the sweet pastry known as Belgian pie. Varieties such as apple, prune, cherry and rice are available for purchase each weekend or by special order. Also, Bring beauty into your home with centerpieces, vases, swags, and wreaths made by Gina. Special orders are taken for weddings, special occasions and memorials. DIY floral project events are offered as well.